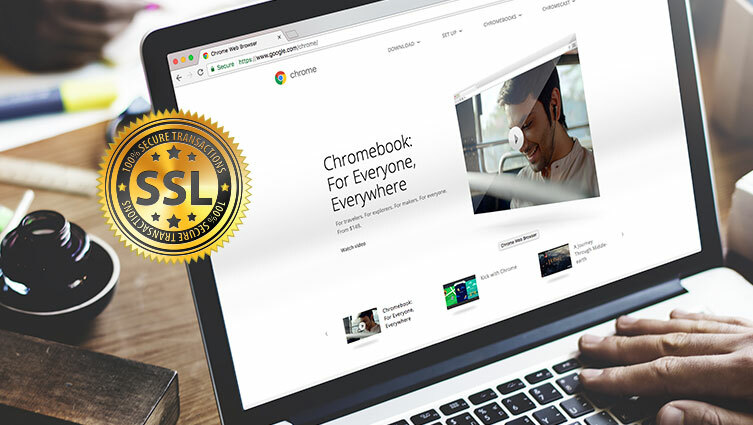 The latest version of Google Chrome launched in January and inline with Google’s long-term plan, websites that do not have SSL certificates and HTTPs pages will be labelled insecure and marked as “not secure”. Google have included these updates to work towards their long-term plan of making the internet safer. What this means is that if your website doesn’t have a SSL certificate and HTTPS pages, when a user visits your site Google will display a message saying that your website is not secure, which is likely to affect users trust in your website and could lead to less enquiries and sales. Secure Socket Layer or SSL is a certificate that ensures all data passed through a link remains private, without SSL personal information users submit such as passwords or credit card details could potentially be intercepted by hackers. HTTPS stands for Hyper Text Transfer Protocol Secure and is the prefix that goes before a website address when the website is secured with a SSL certificate. If your website does not have a SSL certificate it will not display as HTTPS. As we mentioned before, the biggest effect is the loss of trust in your website and company and could potentially lead to a decrease in enquiries, website traffic and sales. It is imperative to have a SSL certificate and HTTPS pages when dealing with personal and sensitive information like passwords and credit card details to ensure the information is encrypted and secure. It is thought that Google may introduce a red warning triangle on unprotected sites to inform users that the site is not secure. With SSL, you get a green padlock or rectangle in the address bar to let users know that the site is secure and can be trusted, this can lead to an increase in trust and conversion rates. Google have also said that there will be a small boost in rankings for sites that are fully protected with an SSL certificate. Having an HTTPS site can be good for SEO, but ensure it is implemented without slowing down the speed of the site. To protect your site, you will need to purchase an SSL certificate as soon as possible or if you already have one it might be worth looking at purchasing an extended validation certificate.